Dr. Kanye West!!!!!!! I'm so proud of you baby & I know your mom would be so proud too!!!! The 37-year-old musician rose to fame after releasing his The College Dropout album in 2004. And on Monday he was presented with an honorary doctoral degree from School of the Art Institute of Chicago (SAIC), a higher learning institution located in his hometown. "I am a pop artist, so my medium is public opinion, and the world is my canvas,” he noted in his speech while accepting the award. The star donned a graduation robe to his acceptance ceremony. And in typical Kanye fashion his speech was infused with a bevy of interesting observations. "I'm sorry is something that you can use a lot," he noted. "It gives you the opportunity to give your opinion, apologise for it, and give your opinion again." Kanye infamously criticised former American president George W. Bush during a Hurricane Katrina charity telethon in 2005. "[Bush] has some very cool self-portraits,” he smiled, evoking laughter in the audience. “I didn't know he was an artist." Kanye informed other graduates of SAIC during his address at the podium that receiving a diploma from the institution will enrich their lives. He also claimed becoming ‘Dr. West’ will benefit his own life greatly. "This honour is gonna make your lives easier," the star noted. "Two reasons: You don't have to defend me as much and I'm going to make all of our lives easier. And it's these Floyd Mayweather belts that are needed to prove what I've been saying my entire life. Whether it's the co-sign of Paul McCartney grabbing me and saying, 'It's okay he doesn't bite white people.' Or The New York Times cover. Or the Time 'Most Influential' cover. And now, a doctorate at the Art Institute of Chicago." 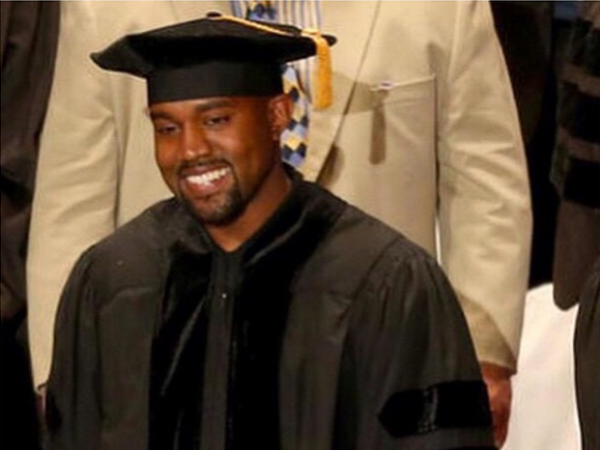 SAIC decided to award Kanye with an honorary doctorate for the star’s “transformative, genre-defying work”.